It’s not secret that we are absolutely obsessed with Tory and Clay. They were sweet enough to let us stay in their guest rooms on our first pit stop to Charleston during our roadtrip to the Key West last week, and we could not have been more grateful! Not only did they great us at the door with cold drinks, but in the morning before their Mepkin Abbey anniversary session, Clay woke up and made everyone hot coffee and cinnamon rolls! Can you say DREAM MAN? Of course we can’t toot Clay’s horn without talking about how amazing Tory is as a friend. I met her through my best friend, Haley, as they were college roommates together! Right away, Tory would go to bat for me over anything because that’s just the kind of lady she is – loyal to the core! 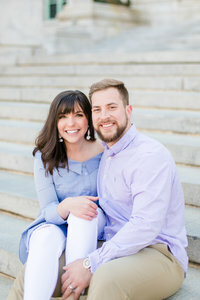 August of last year, she had flown us down to Charleston to photograph her baby brother’s wedding day – and ever since, we have just been obsessed with her family and the city of Charleston! We can’t wait to go back again!! « A Cedar Lakes Woods and Garden Proposal!